Today, I learned about Microsoft Word auto-recovery files. If Microsoft Word crashes and can’t auto-recover the document, find the autosave file. The location is given in File->Options->Save. Sort the directory by date, and your autosave should be at or near the top. The file name ends in .asd. Copy that file elsewhere and open it in Wordpad. Your text will be therein, stripped of all formatting but present. In related news: I’m trying dictation. I know several authors who produce several thousand words per hour with dictation. I would like to produce several thousand words per hour. Seemingly unrelated fact: I habitually hit the “save” button after typing every sentence. Note the key word: typing. In more related news: installing Dragon 15 has made Microsoft Word lock up three times today. The third time, it couldn’t auto-recover the lost text. And I hadn’t even thought about saving. Because I automatically hit “save” every sentence. Beware your habits. They will cause you pain when you change. Also: computers are terrible. I need a stenographer. Who understands MS Word styles. Next weekend, April 28-30 2017, I’ll be at Penguicon. Two weekends after that (12-14 May), I’ll be at Kansas LinuxFest. But we’re on Penguicon right now. 9PM: The OpenBSD Web Stack – OpenBSD is best known for security and networking. But they also have a highly secure web server and load balancer. This talk will take you through the OpenBSD web stack, presenting its strengths and disadvantages. We’ll cover the httpd web server, free globally valid SSL certificates through ACME, the Common Address Redundancy Protocol for two-server clusters, and the relayd load balancer. Many of the security issues common on web servers are simply not an issue on OpenBSD. Come find out why! 9 AM: Writers and Traditional Publishing – So you want to sell a book to a publisher. How do you do that? What should you expect? How do you optimize your chances of getting not just a deal, but the deal you want? What gets some people into traditional publishing, and keeps others out? Come hear authors discuss the good and bad of the publishing biz! 10-11:45AM: Author Meet & Read, Vol. 1 – A big room with Clif Flynt, Mary Lynne Gibbs, Jen Haeger, Christian Klaver, James Frederick Leach, David Erik Nelson, John Scalzi, Clarence Young, and myself, all showing off our books, talking to our readers, and signing books. I will have my books still in print for sale. I’m expecting that the others will all have long lines and I’ll be there alone, so this is your chance to heckle me in person. 10:54-11:03AM: reading from git commit murder – Readings are tightly scheduled, so I expect this to begin and end sharply on time. 1PM: self publishing in 2017 – Self-publishing is an increasingly important channel for authors to reach their readers. It also changes constantly, with new tools and distributors opening daily and existing platforms changing. This panel brings together veteran self-publishers to share their experiences, discuss the changes of the last year, and give new authors an edge in the business. 2PM: 90 second reads – Join a handful of Penguicon authors as they read 90-second passages from their novels. The selections will be thematically linked based on keywords, such as sorrow, fury, funny, love, etc. Timing is crucial! After, there will be a Q&A with the authors. 5PM: Writing High-Performance Nonfiction – Writing nonfiction is not merely reciting facts. It’s a specialized form of storytelling, very different from your college essays and book reports. Whether you’re writing memoirs or computer texts, using storytelling techniques transforms your work for the better. This talk takes you through making your nonfiction not only readable, but memorable. 7PM: BSD Operating Systems in 2017 – I’ll be discussing the current options in BSD-based operating systems, the big news from recent projects, new developments, and where we’re going from here. 11AM: Senior Sysadmin Panel – Storage – The years know things that the days and weeks never know. We’ve gathered half a dozen people who’ve been sysadmins for over 20 years to talk about the one of the most dreaded and annoying topics in computing: storage. 12PM: Self-Promotion for Creatives – Independent creators are their own PR departments. We have to not only make all the things, we have to spread the word about all the things. Here we have a bunch of artists and writer types who successfully spread their work across the world. What works? What doesn’t? How can you be shamelessly self-promoting without being a jerk? Come find out! Where could I use help? In the 90 second reads panel, I get a few 90 second periods to read a selection from my fiction. Each read should have a theme. Our group has four themes: Betrayal, Heartbreaking, Scary, Funny. For those of you who have read my fiction: I could use suggestions for parts of my books that you thought fit these themes. I have a few thoughts, but what I think fits a theme is probably not what struck you lot as fitting that theme. So: if you’ve read my fiction, what of mine would you suggest for a brief reading in any or all of those themes? Last night, I gave an early version of the talk to the smaller, and not recorded, semibug.org crowd. Josh Grosse live-tweeted the event. The actual talk will be recorded. And will have considerably less swearing. Because it’s being recorded. And yes, I think there really will be a Complete and Unexpurgated Edition of PAM Mastery available at the BSDCan 2017 closing auction. All I’ll need to do is add all the swearing back into the book. I have two more public appearances in 2016. October 7-8, I’ll be at Ohio LinuxFest. They’ve asked me to speak on Introducing ZFS. November 8, mug.org has invited me to talk about PAM. This is election day in the United States, so the talk is on how PAM is Un-American. Sadly, family commitments prevent me from going to MeetBSD in Berkeley. Plus, there’s the whole “get on a plane” thing, which I try really really hard to avoid. I’d probably do it to see Berkeley, though. I’m pretty sure a pilgrimage to Berkeley is required once during my lifetime. Other than that, you can catch me at a Semibug meeting. While the folks at Penguicon reserve the right to change the schedule at any time, we’re close enough to the con that I’m comfortable releasing my talks and panel schedule. This is extracted from the official Penguicon descriptions. and schedule. What social media trends does a writer building their web footprint need to understand? What are some Dos and Don’ts? ZFS, the Zettabyte File System, is one of the most full-featured filesystems available today and gives almost unlimited storage flexibility. Originally created by Sun Microsystems, the independent entity OpenZFS now develops ZFS as deployed in illumos, Linux, and FreeBSD. This talk takes you through ZFS’ features, including: data self-healing, deduplication and compression, clones and snapshots, copy-on-write, boot environments, replication, and more. Once you use ZFS, you’ll never understand how you lived without it. Too many organizations have a tense relationship between the network folks and the sysadmins. Sometimes it degenerates just short of war. But basic networking isn’t hard–if it was, network engineers couldn’t do it. This talk teaches the essentials, in a way that lets sysadmins troubleshoot network problems on their own. Sysadmins have amazing visibility into the network, once they know how to use it. We’ll cover cross-platform tools for viewing and troubleshooting the network, on both Windows and Unix. Online backup is incredibly useful, but has many privacy and integrity risks. Tarsnap is an online backup service that only handles your data in encrypted form. It’s inexpensive and reliable. Plus you don’t need to trust the Tarsnap service–they can’t access your backups even if they want to. And Tarsnap’s built-in deduplication saves space, letting you store terabytes of backups in mere gigabytes of disk. This talk takes you through using Tarsnap, from backing up a system to customizing and rotating backups, to fully restoring them. What’s the best way to get your name forward? My first ever fiction reading: my datacenter crime story “Wifi and Romex” I’m sharing this hour with Ken MacGregor. Don’t know which half I’ll get. This panel discusses today’s self-publishing options and business models. Our panelists include authors who are both self- and traditionally published, in fiction and nonfiction, including people who are making an income entirely by self-publishing. We’ll discuss why we made the choice to self-publish, the pitfalls and lessons learned, and which business choices we’ve made on our respective self-publishing efforts. The BSD family of Unix has a been kicking around for almost 40 years now, and have taken different paths than Linux. Come see the last year’s developments in BSD land! One of them just might solve your intractable problem. We’ll talk about new things from FreeBSD, OpenBSD, plus updates from NetBSD, Dragonfly, and assorted derivatives. Some say systems administration is a young man’s game, and that eventually sysadmins rise into management. They’re wrong. A sysadmin who measures their experience in decades has made mistakes younger sysadmins can’t even imagine. This panel lets you learn from their suffering, take advantage of their experience, and laugh at their pain. I’ll have print books at all of my tech talks, including the brand-new FreeBSD Mastery: Advanced ZFS. You’ll be able to find my novels up in the Writer’s Block, rooms 313 & 315. I’ll be kicking around the con the rest of the weekend, except for probably a lunch break Saturday. (Anyone interested in pho?) I’m not making a firm schedule for the rest of the time, but you’ll have a pretty decent chance at finding me at any of these events. Part of the writing process was building a giant spreadsheet listing operating systems, PAM versions, and which modules appear in each OS. Strictly speaking, OpenPAM proper contains very few modules. Most “OpenPAM” modules actually originate from FreeBSD. But people are free to use them, so they generally get lumped into the “OpenPAM module” bucket. One module that’s conspicuous by its absence in pam_listfile. Pam_listfile.so lets you accept or reject access based on the username’s presence in a file. It’s much like the traditional BSD /etc/ftpusers functionality. It’s a reasonable enough module. And I’m told that pam_listfile.so can be compiled to work on FreeBSD, but nobody’s bothered to submit a port. How to make it work is a perennial question on the FreeBSD mailing lists. Here I implement basic pam_listfile.so functionality in a shell script, pam_listfile.sh. Enable pam_listfile.sh as an auth rule. Now all you need is a script. This version of the script permits access if the username appears in /etc/validusers. And here’s a version that rejects access if the username appears in /etc/validusers, exactly like /etc/ftpusers. It’s a huge change, adding an entire exclamation point. You could add more functions as you need. The important thing is to return either 0 or not-zero. And my marketing department says I need to mention that I’m taking sponsors on the print and ebook versions of PAM Mastery. I’m slated to present at the next SemiBUG meeting. By unpopular demand, I’ll offer “FreeBSD Filesystem Fun,” also known as “odd stuff I learned as I’ve written the FreeBSD storage books.” You’ll get content on UFS, ZFS, unionfs, various memory filesystems, and some of the really odd corners I discovered while writing the book. Warning: will contain actual math and ZFS tuning know-how. 15 March. 7 PM. Altair Engineering! On 19 April, Tom Lawrence is coming to talk about pfSense. And on 17 May, Isaac Levy is flying in from New York City to talk about FreeBSD jails. I’d really like to fill our space for this one, as Ike is both a great speaker and making a special flight exclusively for us. Knowing Ike, I suspect that the dinner afterwards will involve beer. June will be a BSDCan trip report, and July, Josh Grosse on porting software to OpenBSD. I submitted several tech events to Penguicon, our local tech/SF/maker/assorted random WTF convention. They accepted six: five talks and one panel. The last one, the Senior Sysadmin Panel, should be a lot of fun. I’m looking for 3-4 more people to sit on that panel. I was a pro sysadmin for 20 years at a variety of organizations. Ideally, while I’m moderating the panel, I’d like to be the junior sysadmin on it. Let me know if you’ll be at Penguicon and interested. I’ve also expressed strong interest in being on the self-publishing panel, but I haven’t heard back on that yet. That’ll be on the lit track. 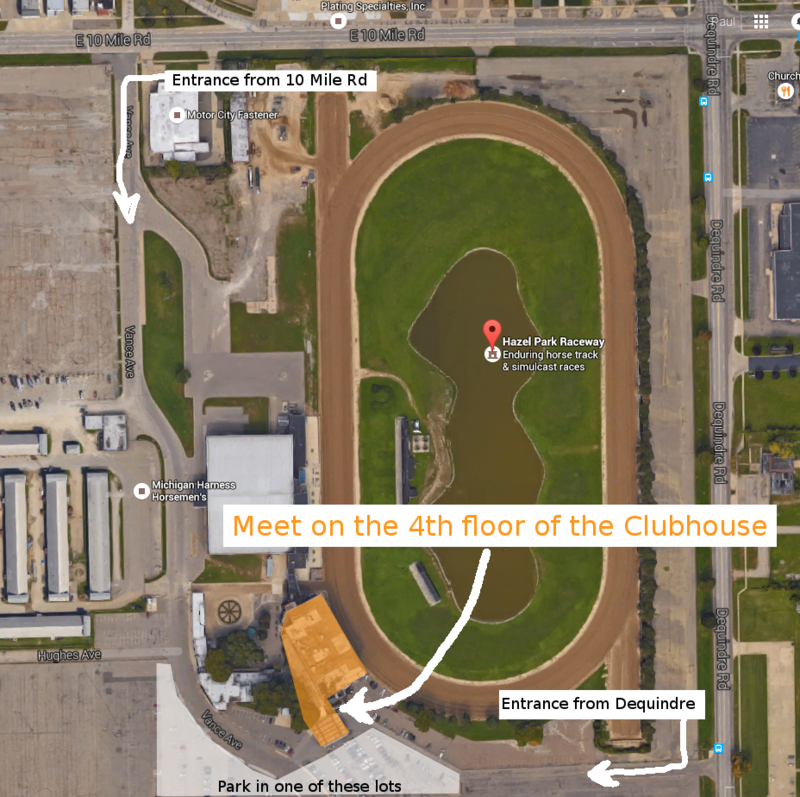 The first meeting for theSoutheast Michigan BSD User Group, aka SEMIBUG, will be next Tuesday, 17 November 2015, at the Hazel Park Raceway restaurant. The restaurant menu is very minimal thanks to the season, but after the meeting interested parties can head out to one of the local places for actual food. Buy a soda or a beer at HPR to justify our presence.